Since the Bureau of Customs is under the Department of Finance, it is directly under the Office of the President. The Commissioners, Deputy Commissioners, and their staff may be removed by President Rodrigo Du30 when he loses confidence in them. On the other hand, the Commission on Elections is an independent constitutional office established under the constitution. The Congress of the Philippines has the authority over the agency through the drafting of resolutions that can change election laws and agreed upon by the Supreme Court as per the judicial review of such acts. Therefore, the Commissioners of the Commission on Election can only be removed through impeachment proceedings where only the Congress can facilitate. As a result, it is not possible for any judicial reviews to allow any military takeover to happen. This is very different from the circumstances surrounding the Bureau of Customs. This is why abuses in the poll agency can flourish because the abusers can build their supporters among lawmakers. Malacañang clarifies that soldiers will not be given appointments or designations at the Bureau of Customs. This is after critics said that a military “takeover” at the bureau would violate the Constitution. President Du3o said he wants the military to “take over” Customs. He appoints Rey Leonardo Guerrero, the country’s former military chief, to the corruption-ridden agency. Panelo argued that the situation at the Customs is akin to “lawlessness” which must be addressed by the President at all costs. “The Constitution says when there is lawless violence, the President can call out the Armed Forces of the Philippines,” he said. 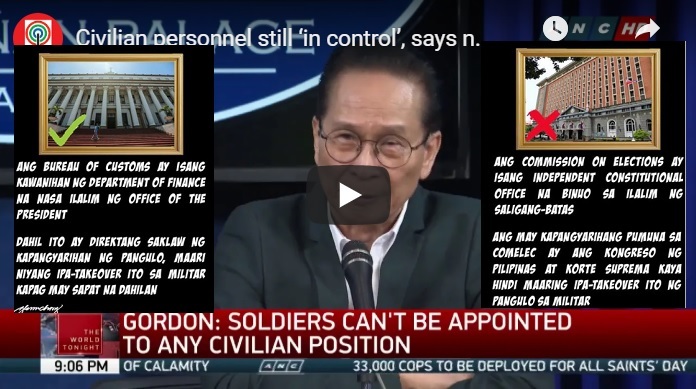 Panelo also explained that the soldiers who might be sent to the Customs will still have to answer to AFP Chief of Staff Carlito Galvez Jr., not Guerrero. This is just to intimidate abusive customs personnel. Department of National Defense (DND) Secretary Delfin Lorenzana said that there’s no “military takeover” order from the President at all. He would, however, take part in the drafting of the guidelines for the plan, along with Finance Secretary Carlos Dominguez and Executive Secretary Salvador Medialdea. The people should know by now why Du30 acted out quickly on the customs’ case. Whereas undermining the Comelec’s incompetence amidst the revelations on digital electoral fraud. In a previous hearing, Atty. Lourdes Mangaoang was grilled over her statement that Customs Commissioners Isidro S. Lapeña can be covering up the shabu shipment incident. She stands by her earlier assessment of the 1 ton worth of shabu being contained in the four magnetic lifters found in Cavite. Her credibility was being questioned and she faces the threat of being cited in contempt when she turned her back on the lawmakers. She now turns to the media in several interviews after she had upset the senators calling the President to sack Lapeña. However, President Rodrigo Du30 said; “Now… General Lapeña will move to TESDA. I will promote you to a Cabinet member position. This is after he fired the deputy commissioners of the Bureau of Customs, and “freezing” the department heads of the bureau as the new commissioner, former Armed Forces chief of staff Rey Guerrero, takes over. [VIDEO]: Atty. Mangaoang resorts to the media when her credibility is questioned in the hearing of the shabu shipment detected by PDEA at the Bureau of Customs. As Mangaoang was presenting her case, she was asked by Antipolo City 2nd District Representative Romeo Acop to go directly to her explanation of why she thinks the magnetic lifters were not empty. Acop was furious when Mangaoang began to turn away from him and faced the cameras of the news team. Acop is saying that this shows disrespect. Deputy Collector Lourdes Mangaoang answers that she only wants to address the people who are currently watching the live broadcast. Acop then reminds her that she is being probed by the House. Consequently, she should face the members of the house. Acop then warns her that this is already her 2nd discourtesy and if she commits a 3rd one she will be cited in contempt. What was being referred to as Mangaoang’s first discourtesy was when she suggested that she could just leave if she was not wanted after she was grilled by Acop. To which, Representative Ace Barbers says that they do not owe anything to Mangaoang for her attendance in the probe. Mangaoang apologized afterward, to Acop as well as the other lawmakers present. To earn their forgiveness she would eve go down on her knees as she says. PDEA Chief Aaron Aquino also maintains that the drugs inside the lifters are currently circulating the country. BOC Commissioner Lapena said before that no shabu packages were found. However, after the investigation of PDEA, he is convinced that there may have been as there were traces found. The magnetic lifters passed through customs without being opened and were found in a warehouse with no more contents. However, even as the investigation is still ongoing, Mangaoang is already calling out Lapena as a liar to the media. President Du30 has fired the deputy commissioners of the Bureau of Customs amid the controversy over the billions of pesos worth of shabu that allegedly slipped past Customs authorities in August. He is also freezing of all, all section department units of the Bureau of Customs. Lapeña has been moved to the lead the Technical Education and Skills Development Authority. Du30 made sure he knew that it was a promotion. 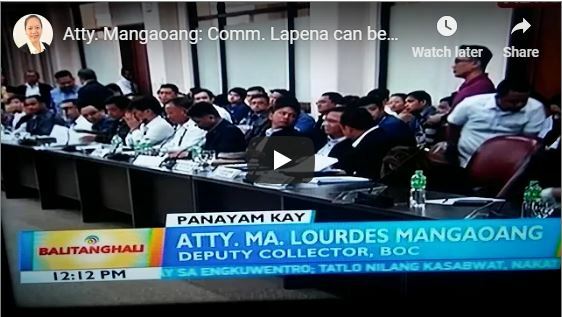 Lapeña and the BOC drew controversy after Deputy Collector Lourdes Mangaoang testified before a House inquiry that customs officials knew about the shabu that was smuggled into the country inside magnetic lifters. The outcome is not quite what Mangaoang is hoping for.